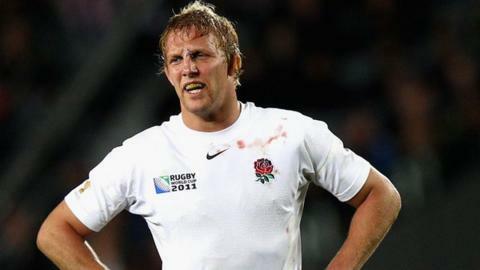 Former England captain Lewis Moody has been named director of rugby at hometown club Bradford on Avon. The 36-year-old ex-Leicester and Bath flanker, capped 71 times for his country, was forced to retire in March 2012 because of a shoulder injury. Moody will now lead his local club in the Southern Counties League, following their promotion from Dorset and Wiltshire One. Their season starts on Saturday, 13 September away at Walcot. "After watching the lads play and earn a very well deserved promotion at the end of last season, I started helping Dave George out with coaching and very quickly realised what I was missing," said Moody. "The enthusiasm, energy, commitment and teamwork the players showed in taking on the new ideas we introduced, made me realise I was ready to come back to the game I love." Moody won two Heineken Cups and seven Premiership titles during a 14 year-spell with Leicester, before joining Bath in March 2010. He helped England win the 2003 World Cup and played in two Tests on the 2005 British and Irish Lions tour of New Zealand.